Millions of older Americans cannot afford a healthy and active lifestyle on Social Security or pension benefits alone. Around 75 percent of seniors depend entirely, or almost entirely, on Social Security for their monthly income. The median income of men 65 and over was $27,612 in 2012 and only $16,040 for women. More than 9 percent of senior Americans were food insecure in 2012. When outside costs, such as medical expenses, are taken into account, more than 15 percent of seniors (almost 9 million) struggled with hunger in 2012. Lack of proper nutrition amongst seniors often leads to health deterioration and higher medical costs. There are many charities that address the issues of hunger in America. And at the same time there are very few that address the problem of hunger among our senior citizens. The meals on wheels programs are currently the only resource that homebound seniors have for nutritional food. 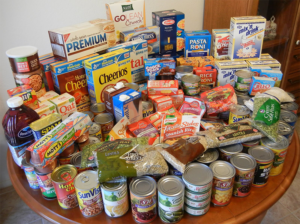 Food Baskets for Seniors is an additional resource for homebound senior citizens to receive nutritional food. Care For The Children does not receive grant money or any state or federal aid. Fundraising has been Care For The Children’s sole means of support. It is the small donations received from people like you that make a big difference. The fundraising part of the Food and Funds Drive is just as important, and sometimes more important than the collection of food. The funds collected play a big part in paying for the cost of storing and delivering the food to the seniors that need it most. A small donation of $10 to $20 enables the charity to deliver one 30 pound food basket per person to 5 to 10 seniors. For a $2 donation, you can make the difference in the life of one homebound senior citizen. Food donations are important and much needed. The items you donate are added to items that the charity receives from other resources. Working together we can bring help to the homebound senior citizens in our community. Everyone has a mother and father that is up there in years, and the Food baskets for Seniors program is here to help them. Imagine the smile on your grandparents face each week when someone comes to visit them and bring them food. We need to keep the love in our hearts for our senior citizens because one day we will be senior citizens ourselves.